Despite his meteoric rise through the ranks of academia, Dr. James L. Moore III, isn’t shy about reminding anyone who he comes into contact with, that he’s a product of South Carolina. It must have been humbling then, when Moore was included along with 11 other influential African-American figures in the South Carolina African-American Heritage Calendar last year. The calendar, which Moore read as a child, is distributed each year to about 100,000 children across the Palmetto State and has included iconic African-Americans who hail from the state, such as the Reverend Jesse L. Jackson, Marian Wright Edelman and the late Dr. Benjamin E. Mays. Born and raised in Lyman, South Carolina, a small blue-collar mill town, Moore left the state to head to Delaware State University, where he had plans to someday play football professionally. But after he suffered an injury, he turned his full attention to his studies, becoming an English education major. He became inspired when he learned that Dr. John McFadden had been named the Benjamin E. Mays Distinguished Professor at the University of South Carolina — the first African-American scholar in the history of the school to be endowed with a professorship. He went on to earn his doctorate in counselor education from Virginia Tech. 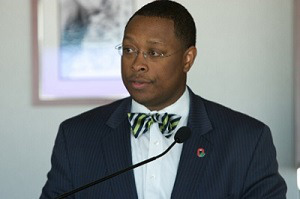 Now, Moore is the inaugural Education and Human Ecology (EHE) Distinguished Professor of Urban Education in the Department of Educational Studies at The Ohio State University (OSU) and concurrently serves as the vice provost for Diversity and Inclusion and the university’s chief diversity officer. He is also the executive director of OSUs’ Todd Anthony Bell National Resource Center on the African-American Male. In addition to his many administrative duties, Moore has kept up a robust research agenda, churning out dozens of articles, book chapters and edited books and delivering more than 200 research and scholarly lectures. As an instructor, Moore has taught a variety of classes ranging from Introduction to Counseling, Transcultural Issues and Strategies in School Counseling to Multicultural Issues in Counseling. From 2005 to 2017, Moore served as a program director for Broadening Participation in Engineering at the National Science Foundation. Dr. Desireé Vega, an assistant professor of School Psychology at the University of Arizona, has known Moore for a decade. He served on her dissertation committee at OSU. Vega says that Moore provided her with invaluable mentorship across the years. “As a faculty member today, Dr. Moore continues to play a key role in my professional development,” she says, adding that he shares opportunities and experiences that will enhance her career. Moore says that he has been afforded immense opportunities at OSU to execute a research agenda that is closely aligned to his personal values, adding that OSU’s College of Education and Human Ecology has a total of four faculty members who were honored to receive a distinguished professorship. This article appeared in the September 20, 2018 edition of Diverse. This is one in a series of profiles about distinguished professors of education.